Imagine a public ownership success story that's been going for 1,130 years. Wow! The Royal Mint is exactly that. When you jangle loose change in your purse or wallet, you probably don't think about where those coins come from. Over a thousand years of craftsmanship have created them. Today the Royal Mint makes coins for countries around the world and makes a profit for the public purse. Its aim is to be the world's best mint. Let's be proud of our oldest publicly owned institution. The London Mint first became a single institution in 886 AD. Sir Isaac Newton took up the post of Warden of the Mint, responsible for investigating cases of counterfeiting, in 1696. "The Royal Mint is one of the world's oldest organisations with over 1,000 years of history. We've been trusted with the manufacture of British coins by monarchy and government, making coins in Britain since around 900 AD and have been making bullion coins since the 14th century." Royal Mint video on its bullion offering. The Royal Mint makes five billion coins a year. Every year it makes millions in profit for the public purse - £6.5 million in 2017/18. It reduces costs by making production more efficient and cutting out waste. We can be proud, both of the heritage of the Royal Mint and of its innovative approach today. It uses state-of-the-art technology to maintain its position as one of the world's leading export mints. The Royal Mint makes coins for an average of 60 countries a year - around 15% of the global market. The Royal Mint is currently a government owned company. It was threatened with privatisation in 2009 when Alistair Darling (then the Chancellor of the Exchequer) began planning to sell it off. Luckily, those plans were dropped - phew! 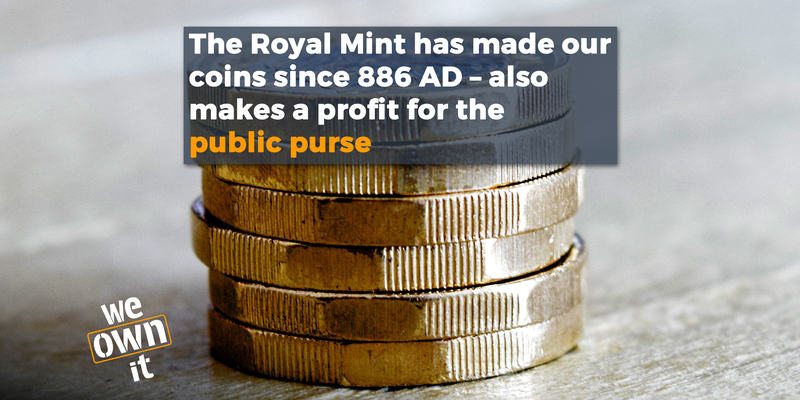 The Royal Mint has been proving that public ownership goes hand in hand with high quality and innovation for 1,130 years. That's something to celebrate!